1) Many thanks to those of you who've clicked on the new Google ads littered around the joint. I don't know whether you're just being nice, or whether this 'targeted marketing' mumbo-jumbo actually works. And frankly, I don't care, either. All I know is that in one single day (today), the money in my GooglePot -- which is going towards buying my soon-to-be new bestest blogging buddy, as outlined in yesterday's post -- has more than tripled. Tripled! That's spectacular, people! So, yeah. I'm up to $3.41. I could probably collect aluminum cans faster to scrape up the cash, but where's the fun in that, dammit? B) For anyone out there who's both fond of my nonsense and particularly willing to be helpful -- and what's the chance of that? -- I'd also like to offer another way to push us toward that 'post-a-day-for-a-year' goal. Way down on the left sidebar are buttons via which you can sign up for your own Google Ads or download the nifty Firefox browser. By clicking through that way to get your goodies, you count me as a referrer, which gets me... well, I don't know what it gets me, actually. Who has time to read fine print? But it's something good, probably. Like money, or a tuna sammich, or a Radio Shack gift certificate or something. Who knows -- I'm just pointing out the buttons. iii) Finally, I took a long-overdue look at the 'Selected Drivel' links there on the right sidebar, and updated a few of the links. If you haven't been archive-diving lately, or are looking for an extra chuckle or two, you might want to start over there. I won't make any promises, but those are a few of the finest examples of the juvenile nonsense being spewed around here. That's why it's "Selected Drivel", you see. Very fancy. Okay, enough administrivia. For tonight's trick, I'm going to follow up a post from last month wherein I introduced the How I Feel About... series. Then, it was 'pirates'. And tonight -- borrowed from the site where I first posted it, and with apologies to those (one) of you who have to read it twice -- it's 'pinatas'. Hope you like it, folks. Grab a stick and a blindfold, spin around three times, and enjoy! 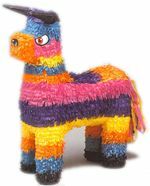 Pinatas are GOOD because the word comes from Spanish, and Spanish words are fun to say. If you go to Taco Bell and order a 'pinata, por favor', they'll likely give you food, like a taco or enchilada or something. Because they don't know any better, either. 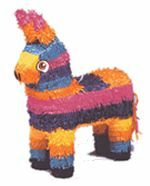 Pinatas are BAD because the 'n' in pinata is properly spelled with a squiggle over it called a tilde. My keyboard doesn't have an 'n' with a squiggle over it. The Spanish are trying to get us to spell with letters that don't exist, according to my keyboard. Damned dirty Spaniards. But pinatas are GOOD because if you make them out of concrete or reinforced steel, you can keep an entire neighborhood's worth of kids busy in someone else's yard for hours. And if the string breaks, you might actually take one or two of them out. And that's how I feel about pinatas. * NOTE #1: If you're looking for a real pinata, you could probably do worse than Party Delights, where all the pics above came from. I've never seen so many smackable candy-filled carcasses in one place in my life. * NOTE #2: No hula dancers or 'damned dirty Spaniards' were actually harmed in the making of this post. Really, I dig Spanish folks, and they're actually very clean, as a people. Plus, hula dancers are pretty hot. Rawr! "I dig Spanish folks, and they're actually very clean, as a people." I could do a "How I feel about..." for one of my blogs, but I don't have the dedication you have. I just can't write that profusely...I don't think I can anyway. Thinking on it, however, I realize that I talk a lot so isn't blogging like talking? Hmmmm...something else to wrap my mind around. I just can't stop giggling long enough to finish the thought. but I don't know how to get it over the "n." Kind of stupid to have the key, then, isn't it? Hey, I have a tilde key too...~~~~~...wow. What good is it though? Hmmmm...wrap my mind around that now. So I'm sending a post to blog that is over a year old. One did have a terra cotta lining which doesn't seem terribly safe. To prove that I truly am an uber-geek the character can be produced by holding the alt key and typing 164, 165 on the number pad....ñ Ñ. It also has a name which phonetically I can't reproduce here. The Ñ key is hiding over there on your num pad. You thought it was numb, didn't you? Press ALT-203 for the capital version and ALT-241 for this ñ . This will not work on the regular numbers, only on the numb numbers. And don't get me started on HTML ampersand codes. I obsess over them like some people have the hots for straps on high heels. Now where's the key that teaches me how to rrrrrrrroll my r's properly?